Synopsis: This is the tale of Sutter Keely (Miles Teller), a high school senior and effortless charmer, and of how he unexpectedly falls in love with “the good girl” Aimee Finecky (Shailene Woodley). What starts as an unlikely romance, becomes a sharp-eyed, straight-up snapshot of the heady confusion and haunting passion of youth – one that doesn’t look for tidy truths. Young love isn’t what you see in the movies. It’s oftentimes a messy, complicated affair brought on by hormones and naivety. Teenage love can also be something beautiful – a moment in time that you’ll always remember for being both good and bad. The Spectacular Now, from director James Ponsoldt and starring Miles Teller and Shailene Woodley, captures teenage love in a way few films ever have before. There’s no pretext, no ugly duckling bet, and no sudden moment of clarity; this is not your average teenage love story. And yet, at the same time, The Spectacular Now is your average teenage love story. It’s about a directionless senior with a drinking problem named Sutter and the brainy, quiet girl named Aimee he “meets” (they have been enrolled in the same school for four years) purely by chance. They develop a friendship, which turns into a relationship, and eventually they are tossing around the “L” word. But while Aimee sees Sutter as her boyfriend, the feeling isn’t necessarily mutual. Sutter only finds comfort in Aimee when it’s convenient. That’s what I mean when I say The Spectacular Now is and isn’t your average teenage love story. It’s teenage love that you might have experienced in your formative years, but that is rarely shown on screen these days. There are moments that might fall into the teenage cliche category, but even those scenes play out in unexpected ways. The Spectacular Now is the high school drama that Hollywood would never make, and that’s no more obvious than in the film’s minimal use of make up. There’s really no better way to establish a raw, intimate portrait than by shooting your subjects in natural light, blemishes and all. While a lot of The Spectacular Now‘s success should be attributed to Sutter and Aimee’s story, there are still plenty of equally engaging elements to the overall narrative. Sutter’s bout with alcoholism at a young age, and his lack of drive when it comes to the future, will resonate with a lot of moviegoers. He’s a familiar, self-destructive force, but one that is packaged within an incredibly likable kid. And although we don’t see much of Aimee outside of Sutter’s POV, her willingness to fit in and turn a blind eye to his rebuffs makes you love her and feel bad for her all at the same time. These B-plot lines would have made for interesting and thoughtful films on their own, but the fact that they seamlessly blend with the larger Aimee/Sutter love story makes the film dynamic. The Spectacular Now, for a lot of people, will feel like a time capsule of their life as a teenager, either in small pieces or a whole cloth. The film’s relatable and realistic characters, it’s charming yet authentic love story, and its willingness to buck Hollywood trends put it at the forefront of the teen romance genre. The script is strong to begin with, and is only made stronger by the performances of its leads. Director James Ponsoldt also deserves credit for having a clear vision and understanding of how this story needed to be told. 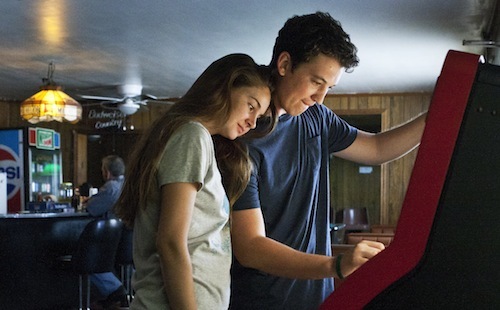 The Spectacular Now will connect with audiences in different ways, but it’s the authentic depiction of young love that makes it stand out. Screenwriters Scott Neustadter and Michael H. Weber first broke onto the scene with the indie darling 500 Days of Summer, but I think The Spectacular Now is their more accomplished work. Whereas 500 Days of Summer was a fantastical, hyper-realistic look at a relationship from blissful beginning to devastating end, The Spectacular Now is a raw portrait of young love in a form seldom shown on screen. Sutter and Aimee don’t meet, lock eyes, and instantly fall for each other – well, Aimee does – their relationship develops more so because Sutter takes pity on Aimee. There’s a bond between the two, there’s no question there, but oftentimes relationships develop where one person sees the bond while the other does not. That realistic portrayal of young love makes The Spectacular Now exceptionally unique, and worth recommending all by itself, but there are more layers to the story beyond the unconventional story. So even if you’re the type of person that can’t relate to the love story, there are plenty of elements to the script that are brutally raw and honest in their own right. The Spectacular Now has a lot to say about the life of a teenager in a small town and it gets its message across through its natural dialogue and well-realized characters. Hand in hand with the film’s fantastic script, the acting in The Spectacular Now is of the highest caliber. From top to bottom, the cast in this film is firing on all cylinders, even those actors who are in maybe one or two scenes. Films like The Spectacular Now are typically only as good as their adult cast, like the single mother played by Jennifer Jason Leigh, the concerned teacher played by Andre Royo, or the friendly boss played by Bob Odenkirk, and every one of them steps up regardless of the meatiness of their role. But, of course, The Spectacular Now wouldn’t feel as authentic as it does without its two leads. Miles Teller and Shailene Woodley are perfect in their respective roles; he as the cocky, self-assured party fiend and she as the love-obsessed nerdy girl. The best compliment I can give to each of these talented young actors is that I believed their characters. I could see the vulnerability in Woodley’s performance as she hopelessly flings herself at Sutter, and I hated Sutter for every stupid mistake he made. I can’t say enough about these two, and I very much look forward to seeing more from them in the future.